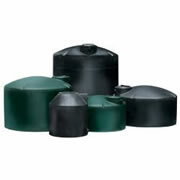 Rainwater Harvesting that save water and the environment. Rainwater harvesting is an innovative system that any homeowner can use to capture rainwater, store it and use it later for irrigation. By combining Drip Irrigation with rain water harvesting, we are able to literally irrigate our landscapes for free. The financial savings earned by homeowners that install Rainwater Harvesting and Drip Irrigation systems are substantial, but the real winner is the environment, as urban run-off is a major problem. 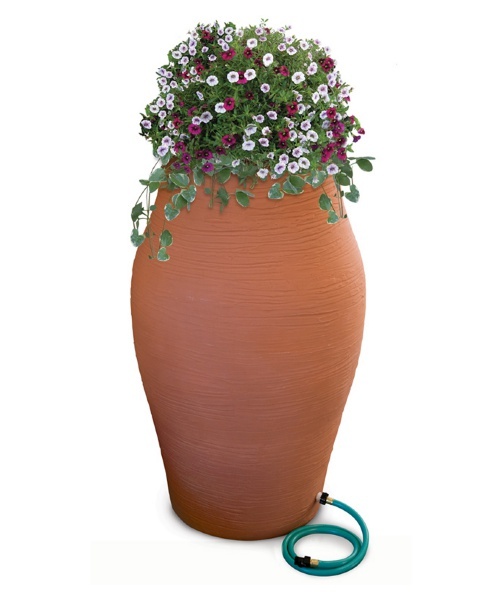 Urban run-off consists of the water that runs off impervious polluted surfaces, such as roads, driveways, pathways, and also toxic pesticide and fertilizer ridden turf. The water is taken away by overloaded storm sewers at an increasing volume, as the number of developments keep growing, while attempting to push more water through an existing pipe system. The pipes cannot handle the combined flows and then back up, causing floods and, in some cases, are allowed to bypass treatment facilities and empty directly into the nearest water body. The untreated high volumes of water disrupt the natural ecosystem with pollutants, and the increased velocity strips away the native vegetation and causes soil erosion, which ends up blocking our river mouths. Eventually all of our polluted storm water flows to the sea, and at the mouth of every major river in the world is a dead zone, caused by problems associated with urban run-off and storm water. 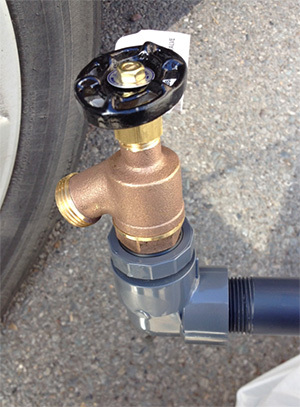 A Drip Irrigation System, fed by a Rain Water Harvesting , helps to prevent these ecological problems, while saving homeowners thousands of dollars in utility costs, and improving property values. 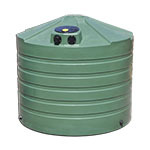 1320 Gallon Bushman Rainwater Harvesting Tank. 50 to 55 Gallons system. 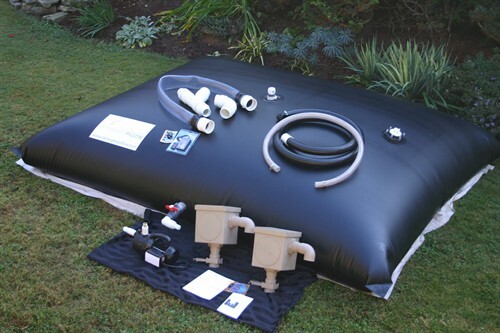 Pillow system 1000 gallons and up. Vertical, such as along the side of a house or building. Thinking outside the box, how about installing the Rainwater Hog within a building envelope and have the tanks serve as thermal storage for passive solar heating systems?! rainwater hog upright along a fence Space is precious. Water is too. Sally Dominguez has designed an innovative vessel that stores a large volume of water in a very small footprint. 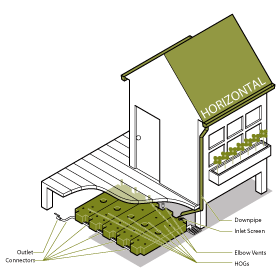 With a cistern capacity of 50 gallons, in a footprint of just 1.3 sq ft, Rainwater HOG modules can fit under decks, up against walls and along side narrow passageways. The Rainwater HOG is currently available in Olive Green. 71" x 20 " x 9.5" so it fits nicely between studs.